It's a selection of soggy sword-and/or-sorcery sagas by some of comics' finest creators! In “Krill the Conqueror” by Braden Lamb & Shelly Paroline (“Adventure Time”), a tiny barbarian pest vows to retake his vermin people's lost kingdom, the Krusty Krab--but why is SpongeBob helping him? Next in “The Scheme of the Sinister Submersible”, Mermaid Man–armed only with lame party tricks–must rescue that famous aquatic wizard the Divining Diver from the depths of Damp Dimension! 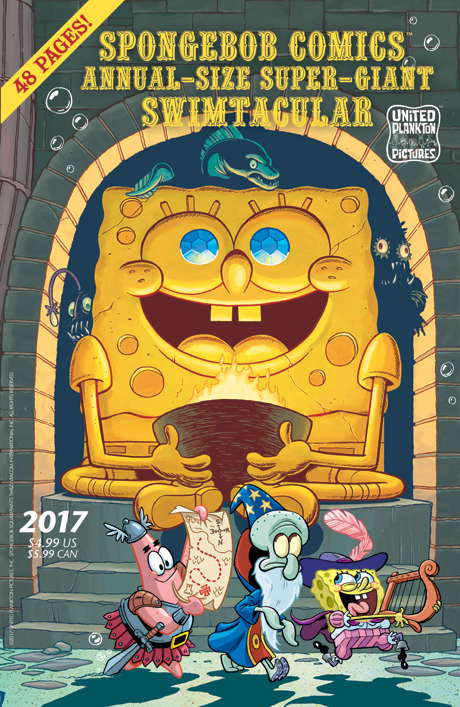 Then read along with Patrick and SpongeBob as they make their way through a Dangers & Dead Ends Pick-Your-Own-Predicament book—“The Monster Boat of Frighfulness!” All this brought to you wrapped in a Jacob Chabot cover that's a veritable handbook of advanced hilarity. You'll be dragon your friends to read it when you're dungeon with it!